Paultons Park – Award winning home of Peppa Pig World and Lost Kingdom is a family owned and run theme park which opened in 1983 originally as a country park. Today we are the No 1 Family Theme Park in the UK welcoming around 1 million visitors a year. Our aim is to provide our guests with a unique family experience that represents the best value for money day out in a safe and quality environment. The Park has over 70 rides and attractions, including a 4D cinema, superb restaurant facilities, exciting shops, an education centre and corporate facilities. The beautifully kept grounds and gardens are a real key feature along with our livestock collection including cute meerkats & cheeky parrots. Our guests can enjoy a whole day at the Park & leave with an abundance of happy memories. If you’re enthusiastic, friendly and work well in a team then come and join us. We recruit throughout the year and all of our permanent and seasonal vacancies are listed below. We do set very high expectations of ourselves and it is essential to our continued success that the standards of service we are able to provide our guests are at the highest possible level. Everyone has a part to play in this - ensuring our guests have a memorable, safe and enjoyable day at the Park whereby they will want to visit again and, as importantly, recommend us to others. We are looking for people who can help deliver this, whether it’s a part time role around your studying or you’re looking for a career change or something to keep you busy. Have a look through our current vacancies listed below (if there are none showing then unfortunately we are currently fully staffed but please check back again soon). Click on the specific job role for further details. Apply quickly and easily using our online application form. We’ll email you when we receive your application and be in touch again if your application is shortlisted. Please make sure your contact details on your application are correct and check your emails regularly. Please note: Minimum age for all job roles is 16 years unless otherwise stated. All minimum age restrictions shown are for reasons of health and safety. If you are unable to complete an online application, you can download our Application Form here or call 02380 814442 and we will post an application to you. Paultons Park is committed to compliance with all relevant UK and EU laws in respect of personal data. If you would like to know more about how any data submitted to us will be used please view our GDPR Privacy Notice for Job Applicants. Sorry, there are currently no permanent vacancies available. 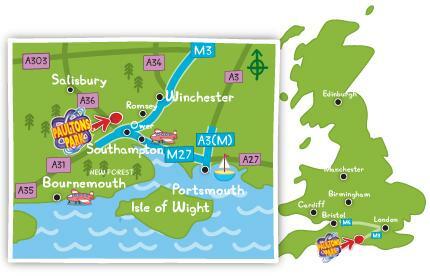 We are located just off J2, M27. Set on the edge of the New Forest National Park we are only served by the REDS X7 bus running between Southampton and Salisbury. You will require a reliable source of transport in order to reach us. Along with the free car parking we also provide a bicycle rack. Please note: It is important that you live within travelling distance of the Park as we have no accommodation on site. If you have a general enquiry regarding jobs at Paultons Park, please email recruitment@paultons.co.uk. Please be assured that we are committed to promoting equality of opportunity for all staff and job applicants. We aim to create a working environment in which all individuals are able to make best use of their skills, free from discrimination or harassment, and in which all decisions are based on merit. HB Leisure is a guest operation at Paultons Park. HB Leisure operates in numerous theme parks and attractions globally and offers a good career development path to employees. On top of your hourly pay there is also the opportunity to earn realistic and achievable performance- related bonuses on a day to day basis. We believe in equality of opportunity and employ people solely on the basis of their abilities. Successful applicants will be working within the Games at Paultons Park. We are serious about giving our guests a fantastic day out and require outgoing and confident people with the ability to sell and effectively communicate with our guests whilst having fun. You will be part of a team required to drive sales throughout the Park, whilst maintaining the highest level of customer service. You will need an outgoing and enthusiastic personality and have a passion for driving sales through guest interaction and communication. Of primary importance is the right attitude, confidence and the ability to work within a team. You will need the kind of personality that allows for a positive guest experience and an understanding of the importance of driving sales within a team.